What NOT to do after you have a car accident? Piggybacking off one of my first ever legal blog post, “What to do when you have a car accident?” I’ve decided to write a post about what not to do after a car accident. What I list may be obvious, but many people have committed these mistakes. Sometimes people will even try to talk you out of doing some these common sense things. If the accident is not very minor, please do not do any of the following. 1) Don’t get a police report. Sometimes after a accident, people try to keep the police out of things and decide not to get a police report. This is a bad idea whether there are injures or not. If you have damage to your vehicle and you are not at fault, the police report is needed when making a claim against the at fault insurance company or your own for a uninsured motorist claim. 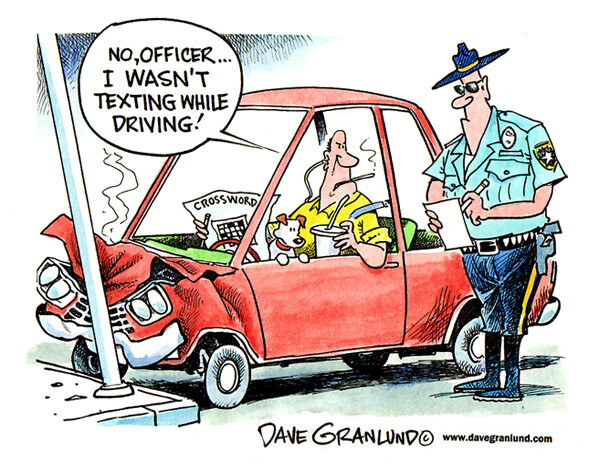 A police report is one of the most vital documents when making a car accident claim. If the accident is not extremely minor, definitely get a police report. 2) Don’t go to the hospital for any injuries. If you have any pain or even some seemingly minor injuries, go the hospital and get checked out. It is better to be safe than sorry. You want to make sure that you don’t have any hidden’t injuries from the accident. Sometimes people don’t feel like they are injured until 2-3 days after the accident when they start to feel some pain related to the accident. You want get checked out on the front end and not the back end. If you wait too long to go to the doctor, insurance adjusters will try to attribute your late visit after an accident to something else and not the car accident. The will make it harder to get the insurance company to pay you for your injuries. Never, ever, ever admit fault even if you think it is your fault. Sometimes you may think you are at fault but you may not be completely at fault. You could only be (50%) at fault. You don’t wanna be on the hook for the whole accident and all of the expenses when you are really only at fault for half of the accident. Percentage of fault matters. Especially in Mississippi because of the type of liability laws we have here. However, if its a super minor accident and you know you are truly at fault then it may be OK to offer the other driver a small settlement (under 500) to get the situation over quickly. If you do decide to offer a settlement outside of the insurance companies, make sure you get the settlement in writing. I wouldn’t do it personally, but I know some people may settle a very minor accident them selves to keep their insurance premiums low. 4) Don’t see a personal injury lawyer for a consultation. No matter how the accident turns out, if you are injured then you definitely want to see a lawyer for an opinion about a potential claim. A good lawyer can give you an estimate of your potential claim and give you a good legal analysis as to whether you may be at fault or not. You usually don’t have to pay for a personal injury consultation because most person injury lawyers do not a consultation fee. We don’t charge for personal injury consultations either. At Hopson Law Group we represent clients who are having a tough time dealing with their insurance companies. You can reach us at 662-624-4100 to set up an appointment for a free consultation! ← Guest Post! Claim Evaluation With Hogan Injury Law!